Joop “Jan” Tjaarda van Sterkenburg, who later changed his name to John Tjaarda, was born in the Netherlands in 1897. As a young man, he studied aeronautical design in the UK with Dr. Alexander Kleminand. He later served in the Dutch Air Force as a pilot and instructor. In 1923, after moving to America and ending up in Los Angeles, California he worked for a time with Harley J. Earl at Don Lees’s coachbuilding and design shop. Tjaarda next moved to New York State and ended up at Locke & Company in Rochester, working on designs for the coachbuilder. Tjaarda designed rear-engined Sterkenburg car featured in the “Modern Mechanics” July, 1931. He next worked for Duesenberg and then for Harley J. Earl in the Art and Colour design section at GM in 1930. At about the same time, Tjaarda was also working on his own series of designs first started in the mid-1920s. He referred to them as the Sterkenburg cars (named after his home in the Netherlands ), the drawings above show two examples. 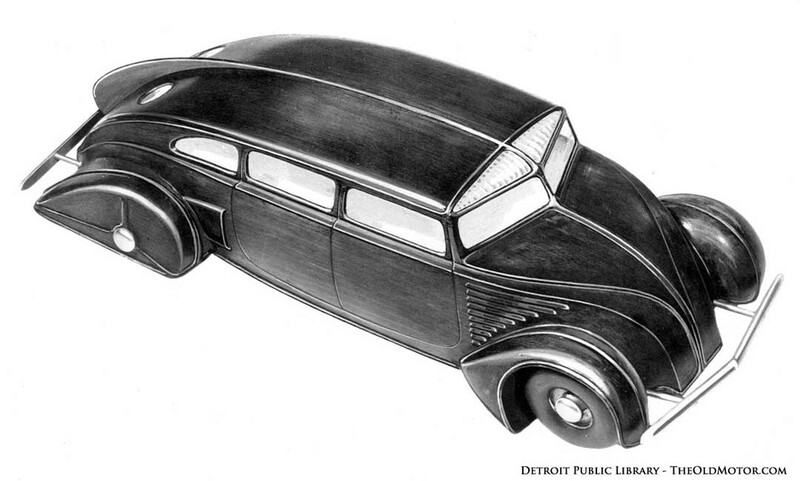 Both of these concepts included a unibody structure and one was designed with a rear-mounted V8 engine, both were featured in the Modern Mechanics July, 1931 issue. The John Tjaarda designed Briggs Manufacturing Company patent application drawings, 1933. Tjaarda next moved to Briggs Manufacturing Company in Detroit where he was appointed the chief of body design. At Briggs he and Howard Bonbright designed a new concept car, which was a streamlined rear-engined design, similar to his earlier work. On November 1st 1933, Tjaarda’s name was listed as the inventor of the concept seen in the patent application photos for Briggs above, the patent was later granted in January of 1935. The Briggs concept car in the Ford Exhibition Building, at the Century of Progress in 1933. Briggs was working on designs for the Chrysler Airflow when Edsel Ford approached the Company in 1933 for help in designing a new smaller-sized Lincoln that Ford was considering putting into production. Briggs responded with the Tjaarda-Bonbright design that was accepted and exhibited at the Ford Pavilion at the Century of Progress Exposition. It was followed up with a complete running and driving rear-engined prototype that was successfully tested in 1934. 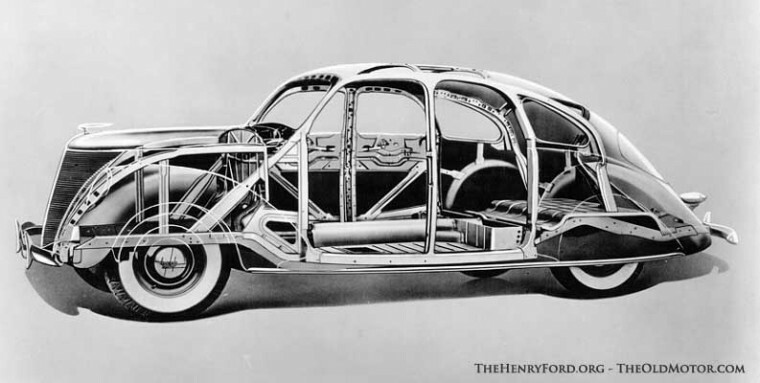 Cutaway view showing the Tjaarda designed unibody structure utilized in the 1936 Lincoln-Zephyr. The design was reengineered at the Ford Motor Company to make it suitable for production. It emerged as the innovative new 1936 Lincoln-Zephyr, a more conventional front-engined car with a different hood and grille designed by Eugene T. Bob Gregorie under the direction of Edsel Ford. 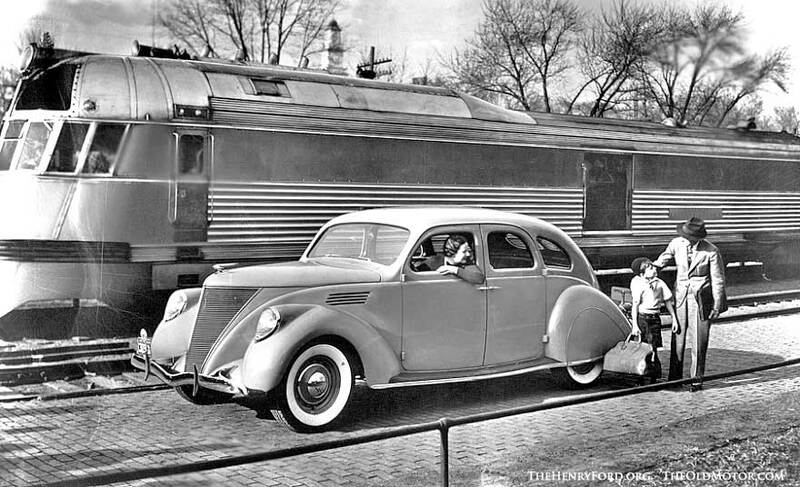 The Ford Motor Company publicity photo below courtesy of the Henry Ford, shows the new 1936 Lincoln Zephyr with its railway namesake, the 1934 Burlington Zephyr. 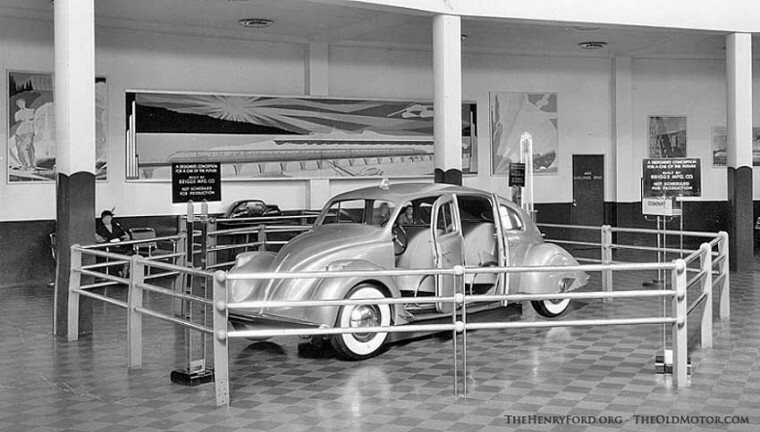 This entry was posted in Auto photos 1921 - 1942 and tagged 1934 Burlington Zephyr, 1936 Lincoln Zephyr, Howard Bonbright, John Tjaarda designed Briggs Manufacturing Company Concept Car, Lincoln-Zephyr Unibody Design, The John Tjaarda Sterkenburg Cars. 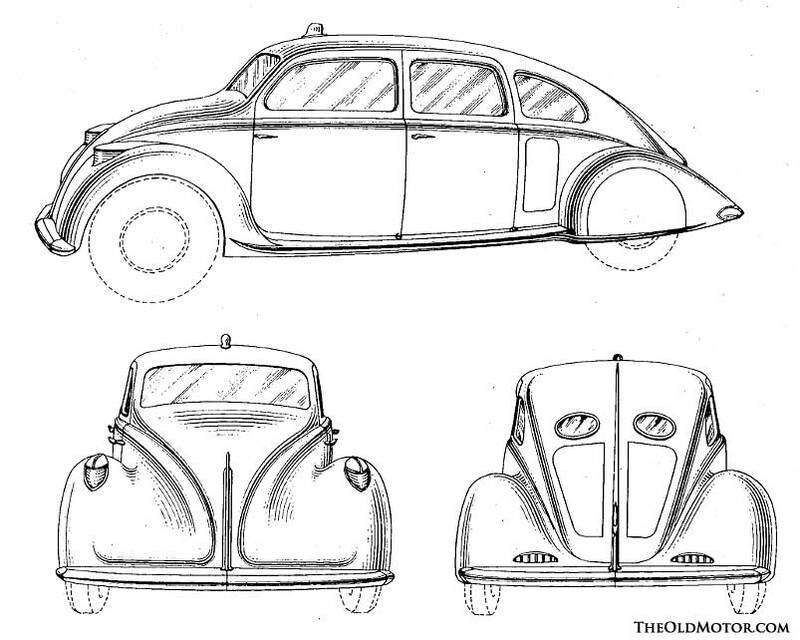 Those designs bear a resemblance to the Stout “Scarab”, and the later Tatra cars. I wonder if there’s any information on the engines, drive trains, or suspension. Tom, I was only able to find the top two drawings in the post, the second one a least gives us more info and was equipped with a V8. And now a I want a Zephyr…. One of these days gonna make it to the Detroit Public Library’s automotive branch-said to be the largest collection of its kind in the world. There are some pictures of the car and power plant in “The Lincoln Continental” By OCee Rich. In one issue of Ford Life Magazine, there was a story on this including a picture of both Henry and Edsel with Ferdinand Porsche, taken in 33 or 34, when he was being shown the running rear engined prototype. The caption said he was given a set of plans. Further reading reveals that Harold Blanchard wrote quite an article on streamlining in the August, 1934 issue of MoToR magazine. Including detail on the rear engined Zephyr prototype. 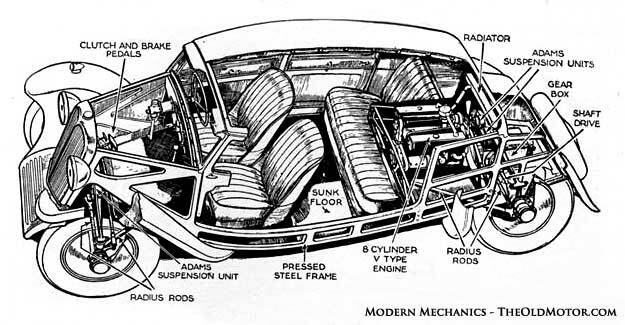 Part of the MoToR article is reproduced in the OCee Rich book, first published in 1963. Those were the days when style had substance. That is what sold a motor car. What a fascinating story! The ’36 Lincoln Zephyr is a classic design but I had no idea of its rear-engined origin. Great photo with the Burlington Zephyr too! So I’m not the only one to look at the photo of the Briggs Concept Car and think ’60’s VW.